Special Price - 27% Off - Very Limited Quantity! Inis Irish perfume, along with Inis body lotion and Inis hand cream are all included in a reusable cosmetic bag. Sorry the Inis gift set is now sold out. Inis is an exciting Irish Cologne for women with a seductive scent, embodying the coolness, clarity and purity of the sea. Developed by the Fragrances of Ireland in conjunction with the perfumer Arthur Burnham, Inis is a daring and seductive Irish perfume blend based on a rugged and robust muguet (lily-of-the-valley) to embody the coolness, clarity, energy and purity of the sea. Added to this is a top note of sparkling, diffusive citrus notes along with traces of marine notes, balanced with base notes of sandalwood and oak moss and deepened with spice notes of cloves and nutmeg. In all, a scent that moves people at many different levels. Inis offers an exceptional value gift set that features some of their most popular items in a travel ready, zippered cosmetic bag. 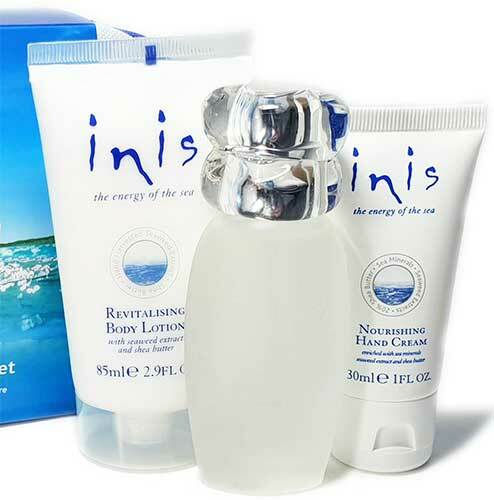 The gift set includes the ever-popular Inis Cologne Spray in a 1 ounce/30ml size, along with seaweed enriched Inis Revitalizing Body Lotion, 2.9 ounce/85ml tube, and Inis Nourishing Hand Cream, 1 ounce/30ml tube. This Inis gift set is available at The Irish Gift House in very limited quantity.